The other day, we posted about our new content workflow, but we didn’t get into how all that content is actually served. Believe it or not, jQuery doesn’t just run on jQuery. The servers themselves are hosted at Media Temple. We have been using their VPS services for many years to host all the things we need to host, of which there are a surprising number. We use over a dozen different servers (of various sizes) hosting everything in the jQuery network including many different web sites, applications and services vital to the community and development team. The reliability of the Media Temple VPS services and network for our infrastructure has been fantastic. We couldn’t manage all of the servers without Puppet. Puppet is a configuration management tool that makes it really easy to express server configuration in a simple scripting language. Tasks like adding a domain to the Nginx configuration can be annoying, and hard to track changes using conventional methods. Using Puppet lets us store all the server configuration needed in a git repository, and deploy new machines very easily. Another product that really shines in our setup is Nginx. Nginx is an open source web server focused on delivering the best performance possible. On our busiest Media Temple Dedicated Virtual server around peak times, Nginx handles about 300 HTTP requests per second, of which about 30 are serving pages from WordPress via php-fpm. Nginx’s built in fastcgi_cache handles a lot of that load, and more like 2 or 3 requests per second actually make it to PHP. Keeping a network of servers running to support a community as large as jQuery’s is a big job. To help ensure everything runs smoothly, we rely on jQuery Infrastructure team members Adam Ulvi and Ryan Neufeld, and for server and network-related issues we count on prompt and helpful support from the Media Temple team. To celebrate their 7 years of serving the jQuery community, Media Temple is extending a special offer on their VPS and Grid Hosting. For the next 5 days, get 50% off an annual purchase of a Grid or VPS (up to level 3) service with the code LovejQuery50. Speaking of support, if you need any support with jQuery, or the related web sites and services, check out one of our IRC channels on freenode. Here in the eastern part of the United States, we’re huddling in subzero temperatures and dealing with the aftermath of a snowstorm. Still, there’s nothing to brighten our moods like the pristine beauty of a freshly fallen release–no, make that TWO releases. jQuery 1.11.0 and 2.1.0 are ready to keep you warm on these dark winter nights. You can get the files off our CDN as always, and either use them directly or download them to your own server. Our download page has all the files and information you need, including pointers to the other CDNs that carry the files. Just give those folks a few days to update! For those of you not following along for a while, both the 1.x and 2.x branches of jQuery support all recent modern browsers and have the same API. The 1.x branch, this time 1.11.0, adds support for the older versions of Internet Explorer (IE6, 7, and 8). The 2.x branch, today played by 2.1.0, adds support for non-traditional web environments like node.js and browser plugins for Chrome and Firefox. jQuery went through a major house-cleaning with the 1.9 release that removed some features. If you haven’t yet moved from an earlier version, see the jQuery 1.9 Upgrade Guide and let the jQuery Migrate plugin do all the heavy lifting for you. Fewer forced layouts: In this release we declared war on places where we might inadvertently force the browser to do a time-consuming layout. We found a few and eliminated one in particular that could occur when changing class names. This can result in a big performance boost for some pages. Granular custom builds: Our modularity is now defined by AMD, and it is easier to build small subsets of the library when space is at a premium. If you want to know more, we’ve hidden the details in the README file where nobody ever looks. Lower startup overhead: The new modularity and avoidance of forced layouts led us to refactor our feature detects so that they run the first time they’re needed. If you never call the API needing that feature detect, you never run that code. Previously we ran all feature detects when the page loaded, that led to delays that were generally small, but added up–especially on mobile platforms. Published on npm: Our releases will now be published on npm so that you can use them with node or browserify. Both the 1.x and 2.x branches are available on npm, but remember that only the 2.x branch is supported to run in node. Published on Bower: We’re now using Bower for our internal dependency management including Sizzle, so you’ll see jQuery releases on Bower as soon as they’re available. Some people have asked about supporting other package managers inside the jQuery library, but we’ve decided to only support the two that we use internally at the moment. There are more than a dozen package/dependency managers, it would be handy if they all could agree on a single format for projects to publish information. We don’t want the package manager’s overhead to be pushed off to individual projects like jQuery. Although the glamor always seems to be in the new stuff, we don’t like to ignore the bugs and inconveniences that people have run across while using the last version. We worked hard to knock down our bug list and tackled quite a few of them. We even fixed a bug that only occurs in IE6, better late than never! This release does not contain the sourcemap comment in the minified file. Sourcemaps have proven to be a very problematic and puzzling thing to developers, spawning hundreds of confused developers on forums like StackOverflow and causing some to think jQuery itself was broken. We hope to bring back and improve sourcemap support in the future, but at the moment neither the design nor the implementation seem suited for situations like jQuery’s, where there are widely distributed files on CDNs. We’d like sourcemaps (and browsers supporting them) to gracefully handle situations like file renaming or missing files. See our bug ticket for more information. This release would not have happened without the hard work of many people. Thanks to everyone who reported bugs, tried out the prerelease files, or provided constructive criticism. Particular thanks are due to Alex Robbin, Amey Sakhadeo, Anthony Ryan, Aurelio DeRosa, Chris Antaki, Chris Price, Christopher Jones, Corey Frang, Daniel Herman, Domenic Denicola, Dominik D. Geyer, Forbes Lindesay, George Kats, Guy Bedford, Ilya Kantor, Jakob Stoeck, Jeremy Dunck, John Paul, Julian Aubourg, Jörn Zaefferer, Lihan Li, Marian Sollmann, Markus Staab, Marlon Landaverde, Michał Gołębiowski, Mike Sidorov, Oleg Gaidarenko, Richard Gibson, Rick Waldron, Ronny Springer, Scott González, Sindre Sorhus, T.J. Crowder, Terry Jones, Timmy Willison, and Timo Tijhof. Colin Snover’s commentary in #jquery-dev is also a source of rare humor for the team. Maintaining an open source project as big as jQuery requires the use of various software and services. Two of the products we rely on and enjoy the most are GitHub and WordPress. We’ve been using and loving Git and GitHub for years now. The community collaboration has been phenomenal. We’ve seen a massive uptick in community-provided bug fixes, refactors, new features, etc. Even within the team, the services provided by GitHub have provided a huge productivity boost. Forks and pull requests provide a great mechanism for sharing code and peer code reviews. The interface renders almost every file exactly how we want it to, especially Markdown. The API and service hooks provide a great way to automate various tasks. Even longer than we’ve been using GitHub, we’ve been using WordPress to manage our various web sites. We have a surprisingly large number of them. Between project sites, API documentation, tutorials, contribution guides, events, and organization sites, the number of web sites we maintain rivals the number of code projects we maintain. WordPress provides tools which make managing this many sites with a common brand almost as simple as maintaining just one site with shared users, theme inheritance, and a great plugin architecture, providing even more hooks than GitHub. Unfortunately, our WordPress experience lacked all the collaboration tools and workflow we love. Only a few people had access to edit content, and collaboration without pull requests is painful. Managing content on api.jquery.com was an even bigger hassle because of our XML based workflow, which the WordPress editor clearly wasn’t designed for. In order to resolve these issues, we decided to find a way to bring these two products together and get the best of both worlds. It started off pretty bumpy, but we managed to do just that! Things started to really pick up when we got the support of WordPress’ Lead Developer Andrew Nacin. Nacin played a key role in getting our new infrastructure set up and ensuring we were using WordPress as efficiently as possible. With his help, and the help of a few new projects – such as node-wordpress, grunt-wordpress, and grunt-jquery-content – we were able to build exactly what we wanted. We now manage our WordPress theme in jquery-wp-content, and the content for all of our sites are stored and managed in individual repositories on GitHub. Storing the content of each site on GitHub gives us all the benefits of tracking tasks in issues, discussions on pull requests, visual diffs for changes, etc. The content of each page is generated by grunt-jquery-content from HTML, XML or Markdown source depending on the repository. This content is then synced to WordPress using grunt-wordpress. Just like our code, all of our site content is open source and released under the terms of the MIT license, with the exception of our branding which is not licensed for use by others. We’re now powering a dozen and a half sites with this new process, averaging 20 contributors per site. Our most popular sites for community contribution are learn.jquery.com which is nearing triple digits and api.jquery.com which currently has 50 contributors. We’re averaging 40 pull requests per site as well, showing just how beneficial this new workflow has been for the team and the community. If you’d like to join in on this community effort, you can read more about our process and how to get involved on our contribution site and help make jQuery better for everyone. Most web developers think about jQuery in terms of its roots, as a library that tries to bring sanity to a disparate set of APIs and quirks that vary from browser to browser. Although that’s one of the things that jQuery was built to do, and still does, it’s not the only thing. jQuery defines a useful API that makes it as easy to work with one element as it does for a dozen. jQuery shortens verbose DOM API names and removes tedious boilerplate code, making it easier to write and to read code. jQuery adds functionality beyond the standard APIs for the work that web developers often need to do. In short, jQuery isn’t just an API repairman for browsers. To the extent that we need to fix problems, we do it. But we’re even more interested in getting browsers to fix their problems, and in shaping future standards to avoid problems, so native APIs will work properly from the start. Then we can all build useful functionality on top of that solid foundation. In order to provide input into emerging standards, the jQuery Foundation joined the World Wide Web Consortium (W3C) and ECMA International last year. In fact, it’s one of the main reasons the Foundation was formed. W3C and ECMA members tend to be representatives of the companies that make browsers and commercial software. We believe that we bring the voice of the rank-and-file web developer to the standards process. Scott González and Kris Borchers have been working to refine the Pointer Events standard. It brings simplicity, regularity, and sanity to the handling of pointer technologies so that developers don’t have inconsistent (and conflicting!) event models for touch and mouse. During the transition, developers will be dealing with three pointer models–mouse, touch, and pointer. jQuery and jQuery UI want to simplify this transition to the standard. Julian Aubourg has been participating on revisions to the XMLHttpRequest standard, a position for which he’s been battle-tested by jQuery’s $.ajax implementation. Knowing all the problems that jQuery has worked around provides him with experience to avoid the same problems in the future. Scott González and TJ VanToll have been active in helping to define HTML5 input types such as <input type=”date”>, providing practical input based on experience with jQuery UI. TJ’s talk at the Portland jQuery Conference does a great job of covering the pitfalls of using HTML5 input types today, and emerging standards like Web Components that could make things easier for web developers. The jQuery Foundation is also a strong advocate of accessibility; we want to make it easy for web developers to reach all users including those with vision or motor impairments. The W3C addresses those issues through the Web Accessibility Initiative, and specifically with Accessible Rich Internet Applications (ARIA). jQuery UI widgets are incorporating ARIA attributes, and Foundation member Deque Systems has sponsored several events on jQuery accessibility issues. Finally, we coordinate and pass along bugs reported to jQuery that are due to standards violations in a particular browser. With most browsers updating every few months, it often doesn’t make sense for jQuery to incorporate large and complex bug fixes for temporary problems. But we’re committed to getting them fixed by the browser makers as soon as possible. jQuery isn’t a highly opinionated framework that demands control over all the DOM. In most cases you can (and often should) use the DOM APIs alongside jQuery. That was always the intended design; you can see it in aspects like the this object inside an event handler being a DOM element, not a jQuery object. About the only place where jQuery requires control is when elements in the DOM are replaced via methods like .html() or removed with a method like .empty(), so that any associated jQuery data can be cleared out. Similarly, the built-in HTML5 input types can coexist with jQuery UI input widgets. jQuery UI is committed to providing user interface widgets that provide great functionality without sacrificing accessibility, inherently supporting standards such as ARIA. The year 2013 was an incredibly exciting one for jQuery. As jQuery celebrates eight years of supporting web developers, it’s time for our annual review. I’m pleased to say that we achieved a lot in 2013 and have some great plans for 2014! In November, Kris Borchers became Executive Director of the jQuery Foundation as successor to Richard Worth. Kris has been a jQuery Foundation board member and a long-time jQuery contributor, so he understands the mission of the Foundation well. We welcome Kris, and thank Richard for his work in shepherding the Foundation through its first full year of existence. It seems impossible to believe there are still web sites that don’t use jQuery, but the statistics at builtwith.com show there are fewer and fewer of them. 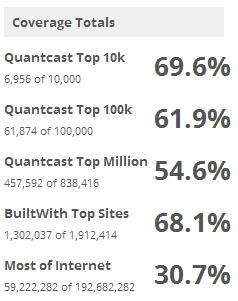 jQuery’s core library is used by more than 61 percent of the top 100,000 sites, up 10 percent from last year. Growth is also strong in other jQuery Foundation projects such as jQuery UI, which is now used by nearly one-fifth of top-10,000 web sites. jQuery is also used in a lot of places that can’t be identified through a web crawl. You’ll find jQuery anywhere web technologies are used, not just the public Internet. That includes Google Chrome add-ons, Mozilla XUL apps and Firefox extensions, Firefox OS apps, Chrome OS apps, Windows 8 Store apps, BlackBerry 10 WebWorks apps, PhoneGap/Cordova apps, Node.js, and even the Sony PlayStation 4. By supporting these technologies, we’ve made it possible to take advantage of jQuery knowledge in many places other than just browsers and web pages. In January 2013, we released jQuery 1.9; then jQuery 2.0 was released in April. These two versions dumped old APIs that were making jQuery bigger, slower, and harder to use. jQuery 2.0 went a step further and dropped support for environments that don’t support newer standards, such as Internet Explorer before version 9. From an API standpoint, the two behave identically, though; web developers can update to the 2.x branch whenever those older versions of IE are no longer important to their web pages or apps. We knew that removing some old functionality from jQuery core could make migration slow and difficult; after all, a lot of code on web sites was written years ago and the people who wrote it are long gone. That’s why we created the jQuery Migrate plugin to identify code that was using the features we removed. Better than that, it allowed most of that old code to continue to work by shimming in the old behavior. It’s a great tool for keeping a site running while things are being updated, although we don’t advise using it for a long-term fix. We haven’t forgotten, however, that most developers keep things simple and just include a copy of the standard jQuery build using a <script> tag. So in 2013 we upgraded our content delivery network (CDN) thanks to a generous donation from MaxCDN. The jQuery CDN is now better than ever and supports the https protocol for delivering all files. jQuery’s use of a convenient and browser-independent layer around the cumbersome DOM interfaces is one reason for its popularity. As Simon St. Laurent put it, “jQuery is how the web routes around broken API design.” But we don’t want the DOM API repair business to be our full-time line of work. People should be continuing to use jQuery because it’s a powerful way to implement designs and provides a vibrant ecosystem of useful plugins, not because the native DOM APIs are broken, verbose, or inconsistent. That’s why we participate in the standards process through bodies such as the W3C and ECMA. Over the next few days, posts on this blog will be counting the ways that the jQuery Foundation is improving the web developer community, in keeping with our mission. If you see something that interests you, we invite you to get in touch with us and participate!